As a painter, my only experience with three-dimensional art is when I try to show the planes in something like a table, or work with perspective to try to draw the viewer into the scene. But a painting is always two dimensional because there is no actual depth. When you add that extra dimension of depth to length and width, you get 3D art. 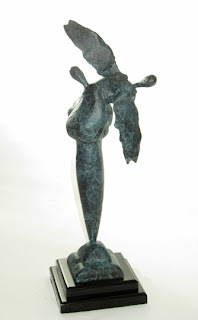 Sculpture is a wonderful form of three-dimensional art. It’s primarily a hands-on process, and color takes a back seat to form. I wanted to know why some of the artists at Wilde Meyer favor sculpture (how can they live without red paint?? ), and learn about their techniques. 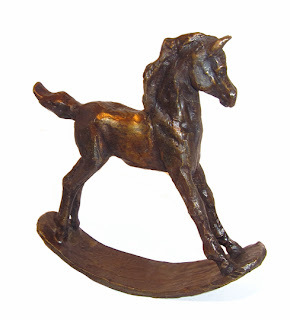 The bronze sculpture is then produced using the lost wax process at the foundry. It’s a pretty interesting process used by many sculptors, which I’ll describe here. A heat-resistant mold is formed around the wood original and encased in plaster. Once dry, the mold is separated into two pieces and the wood original is removed. Sometimes multiple molds are made for one sculpture. 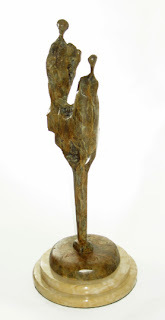 The mold is then bolted together and filled with hot wax to produce a duplicate of the original wood sculpture. The final wax version is dipped in a plaster-like slurry to encase the wax figure. Once hardened, the new plaster mold is placed into an oven at 1800 F, where the wax melts away through ducts in the mold and leaves a plaster reproduction of the original mold. The cavity of the plaster mold is filled with bronze or other desired metal. Once cooled, the plaster is broken away leaving a rough cast version of the original sculpture which now has to be cleaned, reconstructed if more than one mold is necessary, and sandblasted. Now the sculpture is now ready for patina, or coloring. After the piece is washed down to remove any contaminates, it is heated to the applicable temperature depending on the combination of acids used to produce the desired finish. 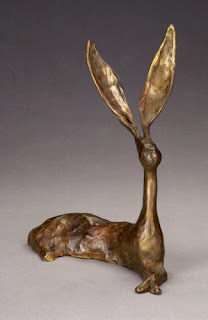 Jim Budish sculpts his smaller pieces in clay, and then casts them in bronze in the same lost wax method as Tony’s. 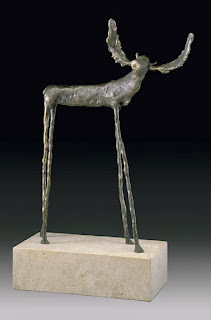 For life-size and monumental works, he prefers to sculpt in low density foam with a hot-knife, applying clay to the surface before casting in bronze. Horses have always been a part of Lisa Gordon’s life. She says that there’s an emotional bond between herself and her horses. If the scale of the piece is small, such as “Rocking Foal,” she’ll make a one-of-a-kind piece that may be part of a series with a theme. 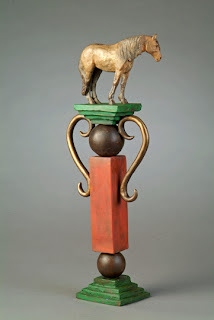 For a sculpture like “Trophy,” Lisa created the horse in that manner, then cast the handles, pedestals and balls. The central column is fabricated and and colored. After speaking with these three artists, I realized that although it’s a tedious process, the pleasure of handling the materials and creating a three-dimensional image is what drives them to pursue this medium. In my next blog, I’m going to speak to some other 3D artists – this time, the mediums will be ceramics and glass.